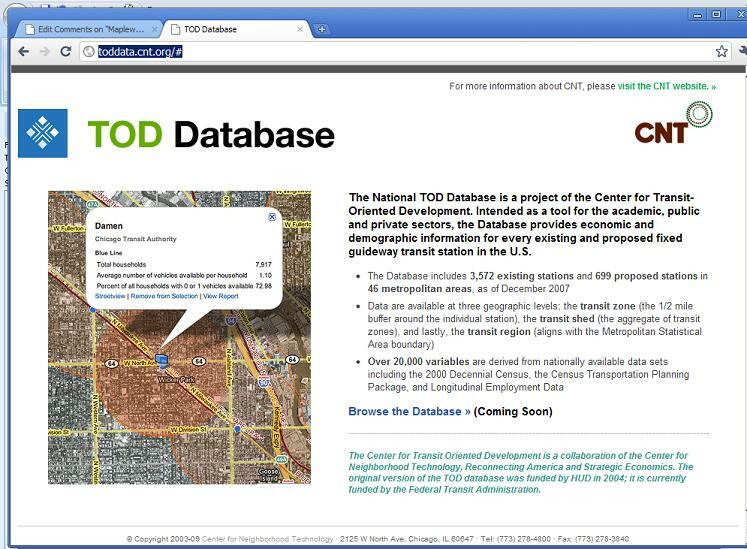 The Center for Transit Oriented Development (CTOD) launched its web database today to help developers, city officials, and investors make better planning decisions and take advantage of development opportunities around transit centers. …Provides information on density, demographics, occupation and transportation habits of households near 4,160 existing and proposed fixed-guideway transit stations, including commuter rail, streetcars, light rail, bus rapid transit and ferries….the database synthesizes 40,000 data fields at half mile and quarter mile buffers around fixed rail stations to create a user-friendly web site that allows people to view maps of various transit regions and choose data reports for stations of interest. Users can also query data by geography or demographics. The database will allow planners and developers to better understand market demographics when proposing future transit-oriented development (TOD) projects. TOD encourages more walkable, liveable neighborhoods, makes use of existing infrastructure, and helps reduce transportation-related pollution and greenhouse gas emissions. The National TOD Database is the second piece of good news recently for transit-oriented development in St. Louis and around the country. The Department of Housing and Urban Development (HUD) announced last Friday that St. Louis is among 45 recipients of the Sustainable Communities Grant Program. The $4.69 million grant for St. Louis will allow regional planners to develop a plan for sustainable regional development. Checked it out, but wasn’t very impressed – lots of pretty dots, but not a lot of really useful information . . .